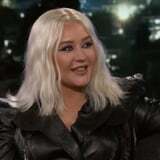 Christina Aguilera may have grown up in the pre-social-media era, but she knows exactly where it would've helped her: squashing alleged feuds. The 37-year-old singer stopped by Jimmy Kimmel Live! on Sept. 12 and talked about how certain platforms could've come in handy when rumors of her rivalry with Britney Spears were circling. But don't worry - Christina's far from mad. In fact, she's ready to record.